Mmmmmmm. Pot Pie. I loved chicken pot pie when I was growing up. All the warm dough, mixed in with the gooey filling. So comforting back then and it still is. Back then I thought it only came in "chicken." Now I know that you can make pot pie using a whole variety of meats or by not using meat at all. I had a half pound of leftover, seasoned meat from the lamb kofta and decided to make a mediterranean themed version. To make it mediterranean I added fava beans to the lamb and used phyllo dough instead of puff pastry or pie crust. I'm hoping this will just be the first of many more gooey, comforting pot pies to come as the season turns cold. If frozen, allow phyllo dough to sit out and come to room temperature (you can do this in the fridge overnight or let it sit at room temperature for about two hours). Heat 1 T olive oil in a medium pan and saute the kofta meat. When almost finished cooking, add the scallions, mushrooms and fava beans and continue to saute. Mix the stock and flour together in a bowl and add to the pan. Allow to simmer gently for 10 minutes, stirring occasionally. Stir in the chile powder and cumin and remove from heat. Spray two individual-sized, oven-proof dishes with cooking spray and cut phyllo to fit over the top. Put half of the meat mixture in each dish and cover with the phyllo. Use the remaining 1 T olive oil to brush the top of the phyllo. Bake the pot pies for 10 minutes and then remove from the oven to sprinkle half the parmesan over each pie. Return them to the oven and cook for an additional 5 - 10 minutes until the phyllo is golden and crispy. Let cool slightly before serving and enjoy! Mmmm comforting yet exotic at the same time. Nice! What a great idea to use the lamb. It sounds very intriguing! This looks great! I love comforting dishes like this! Mmmm... pies! You know I can't resist pies!! I could easily cozy up to this! 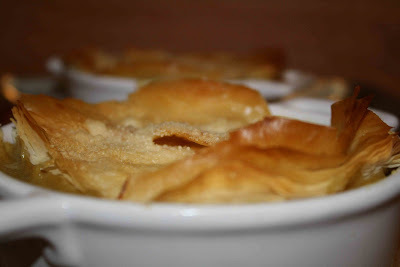 I loved pot pies as a kid too and I wish my mom had made them more often. Great idea using the leftovers. Lamb kofta with phyllo - nothing can beat such superb combo! Look so tasty! This recipe looks great! It never occured to me to make homemade "pot pie" with anything other than chicken. You've just given my cooking muse something to mull over. Looks great, really gives a classic dish a new look and taste.